Stuff about palaeontology, systematics, general biology, and whatever I feel like ranting about when it comes to news, politics, pop culture, or whatever else. Well, here it is in all it's beautiful glory, another piece in the tetrapod origins story has just arrived in two articles in Nature today. I'll give you the chance to oggle at some of the beautifal specimens before I get into the details of what, apart from the obvious makes this thing so interesting. This is Tiktaalik roseae, a lobe-finned fish from the Late Devonian Fram Formation of Arctic Canada. The key features that make this animal a lobe-finned fish are the limbs which clearly have a humerus that branches out to a radius and ulna, like our own limbs. But Tiktaalik is clearly different. It has foregone a lot of the other lobe-finned fish conditions for characteristics that are much more like a tetrapod. In fact, Tiktaalik is without question the most tetrapod-like sarcopterygian known to date, and it fills an important gap in the fossil record. Clearly, it's can no longer be safely jammed into that "fish" category. a, Dorsal view; b, ventral view. Elements with stipple shading were preserved in articulation in NUFV 109 and prepared in the round. Elements with a dashed outline are reconstructed based on their presence in the articulated distal fin of NUFV 110. It is not known how many radials lie distal to the first, second and fourth in the proximal series. Note the dorsal expansion of the distal articular facets on the ulnare and third distal radial/mesomere. The dorsal expansion of these facets would have facilitated extension of the distal fin. a, Stereo pair of left pectoral fin of NUFV 108 in dorsal view showing disparity in size and position of anterior (alp) and posterior (plp) unjointed lepidotrichia and the relative position of dermal girdle elements. b, Right pectoral fin of NUFV 110 in anterior view showing preservation of anterior lepidotrichia (alp), clavicle (cl), scales (sc) and endochondral bones in articulation (H, humerus; U, ulna; u, ulnare; r, radials). The anterior lepidotrichia terminate at the elbow, thus allowing a full range of flexion at that joint. c, Right pectoral fin of NUFV 110 in ventral view showing positions of coracoid (co) and endochondral and dermal fin elements. an, anocleithrum; cb, ceratobranchial; clth, cleithrum; int, intermedium; ri, rib; suc, supracleithrum. Both images from Shubin et al. 2006. Now, recall the story I posted a few days ago. Well, this new material is the result of that expedition that went up to the arctic looking for this type of stuff. 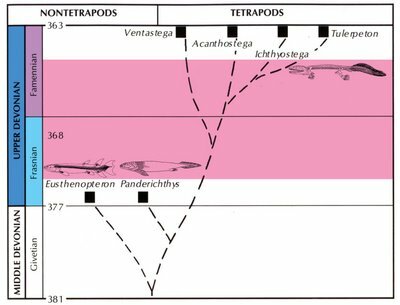 Earlier, I posted this image which was from a book published in 1997, documenting the gap in the fossil record between fishes and tetrapods. The authors put the fish into the context of the following phylogeny, or 'evolutionary tree', using a computer-based analysis. 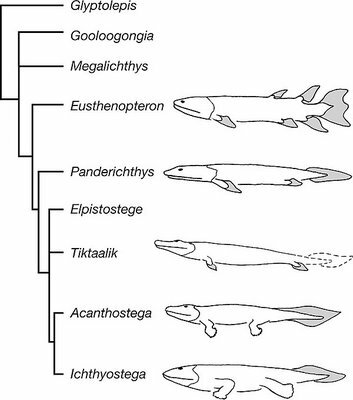 As you can see, Tiktaalik fits squarely in the gap between Panderichthys and other tetrapods -- a precise confirmation of the predictions made by the existing theory and geological knowledge. The important point here is to ask why this animal fits there. Isn't this somewhat arbitrary? Well, no. We already know a lot about what sets tetrapods and fishes apart. Moreover, we've got some really important details from Tiktaalik that allows the authors to place it in the tree where it is. The skull is remarkably tetrapod like. Compare here and here. The resemblances are striking. 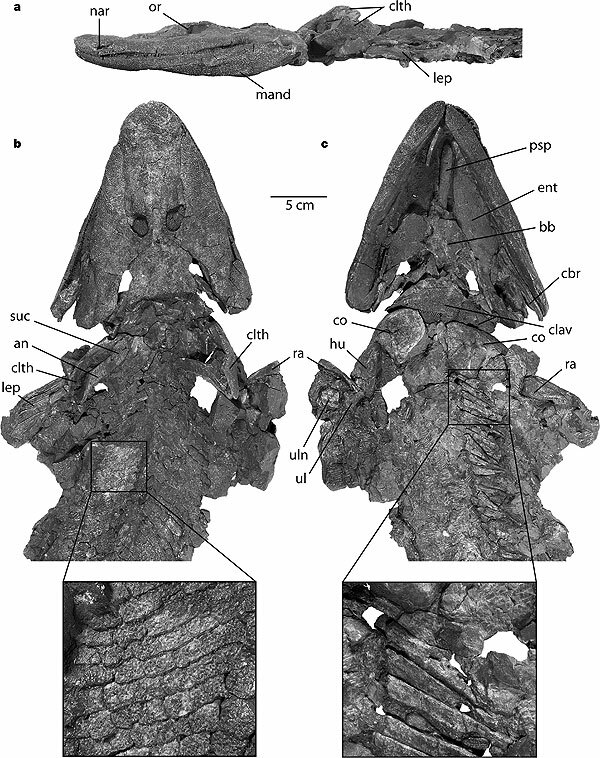 Most notably, is the lengthened snout of Tiktaalik, where even in very tetrapod-like fishes such as Panderichthys, the snout is relatively short and the skull roof behind the eyes is longer. The conditions are opposite in Tiktaalik and early tetrapods. Tetrapods all lack a bony gill cover, while primitive ones (and modern amphibians) retain gills but no bony gill cover. The result is a moveable neck. Unlike even the most tetrapod-like fishes known previously, Tiktaalik has a neck and no bony gill cover. The propotions and shape of the head are a lot more like Acanthostega or other early tetrapod than like any known fish, even (in my opinion), Panderichthys. Another interesting aspect of both Tiktaalik and Panderichthys is their shoulder girdle. What's great about Tiktaalik however, is that we have more, better, and more accessible specimens. The shoulders bone where the limbs attach, is rather puny in most fishes. On the other hand, tetrapods have a rather beefy affair that really helps support the weight of the animal. Tiktaalik shows something much more like the tetrapod condition, with a very beefy shoulder bone. The fin, as illustrated above, is quite interesting. Not only is it fragmented into a bunch of little bones called radials (which are strikingly similar to digits), but there are apparently moveable joints between the units of the fins. When looked at closely, there are evident "roller surfaces" on the bones that permit the neighboring elements to flex, sort of like a primitive wrist. The ear region shows a marked advance on the condition myself and Per Ahlberg described for a similar fish, Panderichthys. Unlike this latter form, however, Tiktaalik has a much broader spiracle and an even shorter hyomandibular bone -- the "gill arch" bone that eventually becomes the "stirrup" bone of the middle ear. In the earliest tetrapods, this bone looks neither like a fish nor like that of modern tetrapods. It's a short nubbin of bone that pokes out from the side of the braincase. The hyomandibula of Tiktaalik, if we can call it that, was a stubby little nubbin, too. However, it was still oriented in the spiracle like a hyomandibular bone. More news will certainly come about this interesting animal. The publications in Nature are generally only preliminary reports and a much more complete description awaits. 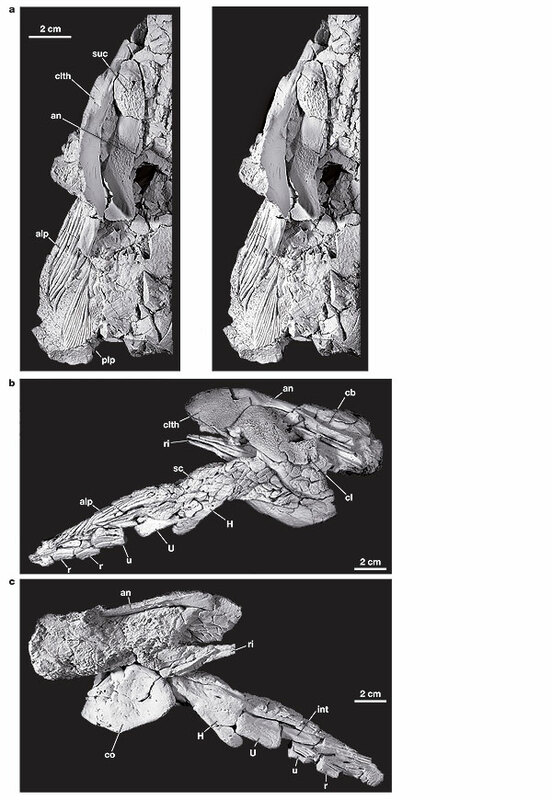 It is usually during this process that the really interesting comparisons come out and we find out how similar/different Tiktaalik is when compared with tetrapods and other lobe-finned fishes. Tiktaalik presents a sort of classic 'transitional form', y'know the kind that creationists say doesn't exist. I can't wait to see how they're going to spin this. I wonder if it will be "just a fish" or if it will attack the integrity of the authors. We'll see. In the meantime, science marches on. EDIT: Pharyngula has it too, with more pics. 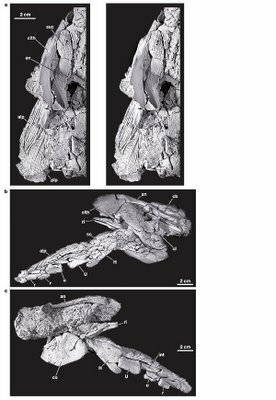 I wrote a report on the Eusthenopteron-Ichthyostega transition once, so I was pretty stoked to see a new transitional tetrapod found. By the way, what selectional pressures do you think drove the evolution of vertebrate terrestriality? I feel I never did answer that satisfactorily. Actually, I can't see that. 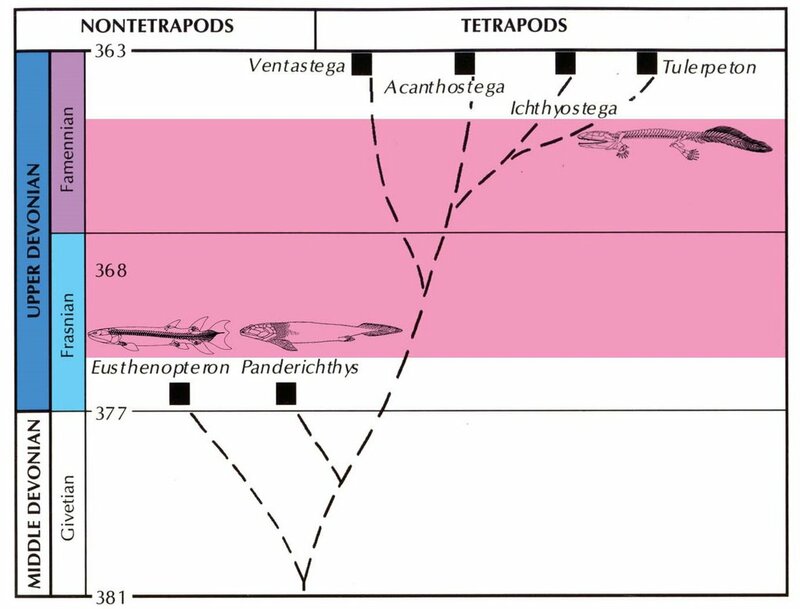 What is bothering me about this cladogram is that Panderichthys seems far more fish-like than Eusthenopteron. Looking at the illustrations of their fins, Panderichthys lacks the bony finger-like structure that is apparent in Eusthenopteron as well as in Tiktaalik, Acanthostega, and Icthyostega. I've been studying these diagrams here and at Pharyngula and Carl Zimmer's place, and it's really puzzling me. Panderichthys looks completely out of place. Are its other skeletal features what cause it to be located where it is in the cladogram? The relationships of these animals is based on more than simply an analysis of fin structure. What places Tiktaalik and Panderichthys where they are has a lot to do with skull and body characters. Also, there is more to a fin skeleton than whether or not there are radials. The fin of Panderichthys is in many respects very tetrapod-like, especially the humerus and the shoulder bone (which are, actually, a lot like Tiktaalik. 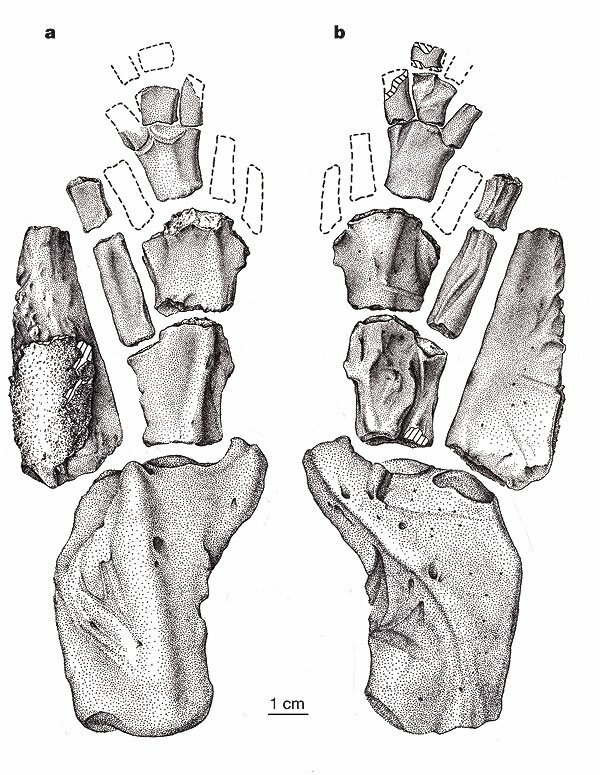 What we see in Panderichthys is apparently a loss of distal elements of the fins (the 'finger-like' things). However, that itself is really uncertain. There is the issue of presence/absence vs. unossification. The fin skeleton is formed of a type of bone that develops from a cartilage precursor which is later replaced by bone as the animal grows. This can be quite variable, especially among fish taxa. It is entirely possible that all that stuff was there but didn't ossify in Panderichthys. Finally, this goes back to the fact that there's more to this tree arrangement than simply the fins. These animals are not ordered there based on some feeling of 'inbetweenedness'. That is, the scientists don't just look at these things and casually arrange them in a tree-like fashion according to what 'feels right'. Rather, a large number of attributes of the animals are considered and a parsimonious distribution is found that minimizes the number of times we have to explain an attribute (or 'character') by evolution. The result is a tree-like diagram that we use to infer evolutionary relationships. I suggest that you check out the Palaeos site on Panderichthys (see also this site) to get a good feel for what the rest of this animal is like. Martin, thank you so much for the reply. That is, the scientists don't just look at these things and casually arrange them in a tree-like fashion according to what 'feels right'. Rather, a large number of attributes of the animals are considered and a parsimonious distribution is found that minimizes the number of times we have to explain an attribute (or 'character') by evolution. Yes, though I'm obviously not a biologist, I do understand parsimony and how these trees are developed. I just found this particular cladogram so counter-intuitive that I wondered what other features placed Panderichthys in that spot, and hadn't been able to find a better description of these animals. Your explanation is wonderful; that is exactly the information I was hoping for. And the links are terrific. Thank you again. What is the impact of this increassed understanding of the fossil record on the development of ideas about the history of life on earth? Research Fellow at NCB Naturalis in Leiden, the Netherlands. My research interests include the fossil record and early evolutionary history of jawed vertebrates. The opinions expressed on this blog are my own and do not necessarily reflect those of NCB Naturalis. Useful science sites, journals, scientific societies etc.